Only then will you become her lover. 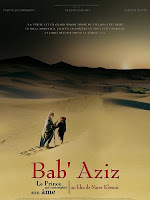 Bab 'Aziz: The Prince Who Contemplated His Soul, is easily one of the most visually rich film of recent time based on Sufi theme. The title is from the main character, Baba Aziz, a very old blind dervish who is on his way to a place unknown where a rare Sufi gathering is to take place. Guiding him across a sea of sand is his granddaughter Ishtar, a little girl who loves her grandpa but who is afraid they might never reach their destination, all the more as the meeting is organized only once every thirty years. But Bab'Aziz is undeterred. He knows that if he "listens to the infinite silence of the desert with his heart" he will find the place. While making their way, they meet strange persons and Bab'Aziz tells Ishtar strange tales. An interesting film that breathes life into the intricately woven fabric of Sufism and makes for a visually dazzling piece. The dialogues are beautiful, carrying many subtle hints of the mystical journey in sufi path, at the same time sing an universal appeal which any thirsty spiritual seeker can relate to. He who has faith will never get lost, my little angel. He who is at peace won't lost his way. Only those who are not in love see their own reflection. - It suffices to walk, just walk. Those who are invited will find the way. So, what happened to the prince? Let me know in the comment section what's your favorite quote, we may compile all here. The music of Bab Aziz (2005) has a lot of interesting fusion, from persian to indian to haunting bengali voice over. The original soundtracks of this film are by composer Armand Amar. Follow the youtube links below to listen to few of the mesmerizing sound tracks from the film. When asked Why this film today? The director and screenplay writer Nacer Khemir described, "I would explain it with this allegory: if you are walking alongside your father and he suddenly falls down, his face in the mud, what would you do? You would help him stand up, and wipe his face with your shirt. My father's face stands for Islam, and I tried to wipe Islam's face clean with my movie, by showing an open, tolerant and friendly Islamic culture, full of love and wisdom, an Islam that is different from the one depicted by the media in the aftermath of 9/11. Fundamentalism, as well as radicalism, is a distorting mirror of Islam. This movie is a modest effort to give Islam its real image back. No other mission seemed as urgent to me as this one: to give a "face" to hundreds of millions of Muslims who are often, if not always, the first victims of terrorism caused by some fundamentalist. And although this movie is based on the joyful and love giving Sufi tradition, it is also a highly political film, and deliberately so. It is a duty nowadays to show to the world another aspect of Islam, otherwise, each one of us will be stifled by his own ignorance of "The other". It is fear that stifles people, not reality. There are nearly 1 billion Muslims in the world, 1/6th of earth inhabitants. To try your best to know your neighbour better is a form of hospitality. Hospitality is not just about housing people and feeding them; hospitality is about listening and understanding. You cannot receive someone in your house, just feed him and ignore him! In my opinion, this is a movie that encourages people to listen to each other and, perhaps further down the line, to really come together. Watching this movie is a way of offering hospitality to "The other one". The reason behind choosing the complementary title, "The Prince Who Contemplated His Soul"? Is it an image of Narcissus? It is true that the Prince leans over the water, but he does not see his own face, like Narcissus did, because whoever sees only his reflection in the water is incapable of love. The prince contemplates what is invisible, that is his own soul. We are all similar to icebergs; only one tenth of us is visible, while the rest lies under The sea. The idea of the "Prince" came to me from a beautiful plate that was painted in Iran in the 12th century. It shows a prince leaning over water, and it carries the following inscription "The prince who contemplated his own soul". This image struck me as something I had to build upon, which is why it seemed obvious to me that the movie should be shot in Iran. Making a film as continuity to a 12th century artist! I don't know if it was a sheer coincidence (or is it something else? ), but we shot parts of the movie in the city of Kashan, which is the city where this plate was made! Now, concerning the structure of this movie, I think it helps the spectator to forget about his own ego and to put it aside in order to open up to the reality of the world. It borrows the structure of the "visions" usually narrated by dervishes, and the structure of their spiraling and whirling dances. The characters change, but the theme remains the same: Love, under many forms. Abou Hassan Al Nouri, a great Sufi, once said: "Sufism is the renouncement of all selfish pleasures", because true Love cannot be selfish. He also said "A true Sufi has no possessions, and he himself is possessed by nothing". Love has many shapes in the movie. The word "dervish" means "Sufi" in Persian. But with time, it was used to refer to those who chose poverty and wandering. They put the world aside and enter into a quest of poverty and Love. 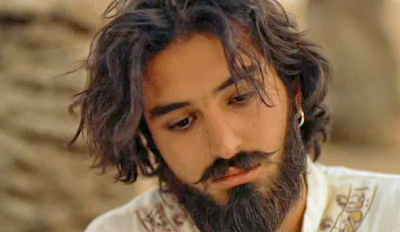 There are many types of dervishes. I did not want to address the different brotherhoods, but I wanted to give an idea of what seems alive in the Islamic-Arab culture: this endless quest for the Absolute and the Infinite. If you must love, then you will need that much courage." 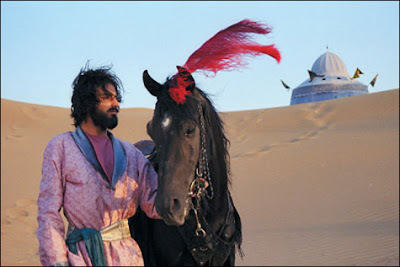 By their actions, dervishes free Islam of certain dogmatic interpretations, just like this auburn dervish in the movie, who is attracted by the minaret, and tries to clear the "dust" off it with a broom. In another scene, he is in a mosque half-buried in the sand and he tries to get it out of its tomb by removing the sand with his mere basket. Wanderers of the Desert | This gentle, lyrical drama about a new teacher’s arrival in a village school in the middle of the desert combines realistic slice-of-life portraits of the day-to-day in the Middle East with startling fantasy and mythical elements that pull from centuries of indigenous lore and legends to give the story a shimmering magical realist quality. (95 minutes). Watch Wanderes of the Desert, El-Haimoune via Youtube.